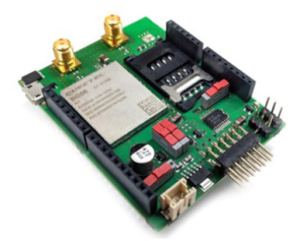 The Avnet Silica NB-IoT Sensor Shield (AVNET-SILICA BG96-SHIELD)is a Cat M1 and NB-IoT board providing Arduino pinout connectors. 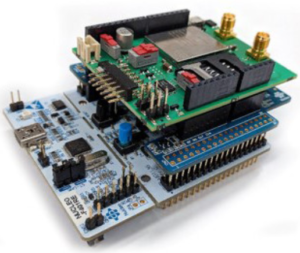 The Arduino compatibility provides ultimate flexibility, leveraging on a huge ecosystem of compatible boards. It enables you to choose the microcontroller board that best fits your application, like STM32 Nucleo boards, and combine them with sensors and other peripheral boards as needed. The Azure example is here. The mBed example is here. With AT commands Avnet Silica’s NB-IoT Sensor Shield is easy to program and supports mbed OS for quick development and leveraging on free stacks like SSL, MQTT, COAP etc. it also support mbed OS 5 open source operating system for integrated embedded development when connected to compatible board such as STM32 Nucleo. 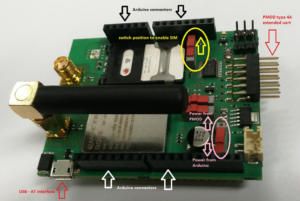 The mbed documentation shows how to run an MQTT client when Avnet Silica NB-IoT sensor shield is connected to STM32 Nucleo-L476RG board and ST X-NUCLEO-IKS01A2 3D Accelerometer and 3D Gyroscope expansion board.